Bluestone Leasing partners with Damar Training for our apprenticeship programme. We believe that the programme is invaluable for finding staff and developing their skills. Bluestone Leasing currently has three apprentices in-house and today we’re featuring Amy McGarry our Apprentice Office Administrator. Read on to let Amy tell you, in her own words, about her apprenticeship with Bluestone. What made you choose to do an apprenticeship after high school rather than further study? I contemplated going to college to study childcare, but once I had a trial day, I realised that it wasn’t the course for me. I then looked into business administration as I was interested in working on computers. I went for a meeting at a college to look into their course and I was advised that an apprenticeship might be the best option for me. Doing an apprenticeship has given me a head start as some of my friends from school who have recently left college are struggling to find jobs in the fields that they studied for. This is why apprenticeships are so brilliant, not only are you getting a qualification at the end of the apprenticeship period, but you have the opportunity to keep the job you’re trained in. When Did Your Apprenticeship Start? 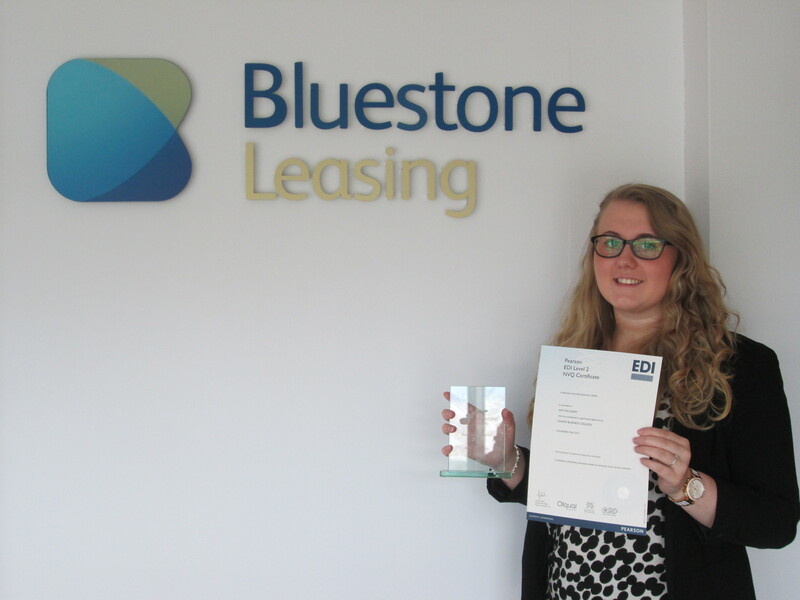 My apprenticeship with Bluestone Leasing started in May 2014 and I set out to study for an intermediate (level 2) apprenticeship in business administration, which is a 12 month course. The course consisted of my daily work duties at Bluestone alongside discussions, observations and assessments with my tutor from Damar Training. It was a huge commitment as I had to juggle my regular workday with preparing for my assessments. Have you completed the programme? The training is ongoing. I recently completed my intermediate level apprenticeship and I’m pleased to say that I’ve now moved on to an advanced apprenticeship in business administration. How did you adjust to working at Bluestone? Soon after I started at Bluestone Leasing we were due to go through an office refit which I was involved in, this helped me get to know everyone in the business as I helped them with moving their belongings and resettling in their new areas. Once the refit was complete I felt proud to be part of such a big change in just a matter of months. After that I really felt like part of the team. What are your personal highlights from the first year of your apprenticeship? In September 2014 my apprenticeship tutor nominated me for Damar’s “Learner of the month” award because of how well I was doing with my apprenticeship and at work. I won the runner up award and was presented with a certificate. I think that Damar was working with over 800 apprentices at the time and so it was quite an achievement. At the start of every year Bluestone Leasing has a ‘Kick Start’ event where we run through all of the previous year’s figures and set new targets for the upcoming year. We also participate in team building exercises and staff are presented with wonderful awards. At 2015’s Kick Start event, I was presented with the “Bluestone Leasing Best New Starter” award for 2014 which I was delighted to receive! I was informed that 100% of my colleagues chose me to win this fantastic award which made me honoured to work with so many amazing people at such a lovely company.